This is a really fun and tasty experiment and I say it's a super cool one too as it works due to a phenomenon called SUPERCOOLING. THIS WILL IMPRESS YOUR FRIENDS! Shake your bottle of fizz. The idea is to make as many bubbles as possible! So shake it hard and shake it for a good 60 seconds or more! We need to build up as much pressure as possible in there. Now put in your freezer for 1 hour so it's cold but the liquid hasn't yet frozen and shake it up as vigorously as possible again and put it back in the freezer. Leave in the freezer for another half and hour to an hour. First shake it gently, if you feel the drink is trying to freeze, slowly and carefully open the bottle, you will notice the water tries to crystallise further, you want to take the lid of slowly so it doesn't do this too much. If it didn't crystallise go to STEP FOUR. If it did crystallise, go to STEP FIVE. Shake the bottle of fizz vigorously again and place back in the freezer for another half an hour and check again. You may need to repeat this a few times. IT IS IMPORTANT TO NOTE DOWN HOW LONG YOUR FREEZER TAKES TO SUPERCOOL YOUR CHOSEN FIZZY DRINK SO YOU CAN JUST LEAVE IT IN FOR THE CORRECT TIME FOR THE DESIRED EFFECT. EVERYONE's IS DIFFERENT SO YOU HAVE TO DO THIS FOR YOURSELF. We have found that this varies depending on the drink we use, some drinks take 2 hours and others take up to 4 hours to work properly. Now you can just shake your bottle and your will see it all instantly freeze! You can also, you will need to be EXTREMELY careful in opening your bottle - as soon as those bubbles disrupt your liquid it will FREEZE! - pour it into a metal or class container, for example a bowl, that has been cooled in the freezer and then stir it with a spoon. It should freeze before your EYES! You can also try pouring it in a bowl at room temperature and then dropping in an ice cube. In this experiment we are cooling the drink until it is cooled on the verge of wanting to freeze; it is way below freezing but it desperately wants to so all it needs is a little friction (energy), which is what it gets when you shake the bottle or stir the drink; because the water has been cooled below freezing without solidifying into ice it can then be stimulated by a catalyst, this time that catalyst is friction which happens when we shake the bottle or in this case the friction caused by the gas trapped inside our fizzy drink bottle. When these bubbles move, they cause friction which then causes the liquid to freeze and create the perfect slush drink! This is called Supercooling and happens because the inside of the bottle, coupled with gas pressure has very few, if none nucleation sites for ice crystals to form. Supercooling happens during solidification, when liquid turns to solid. To create this effect you need to bring a liquids freezing point down. 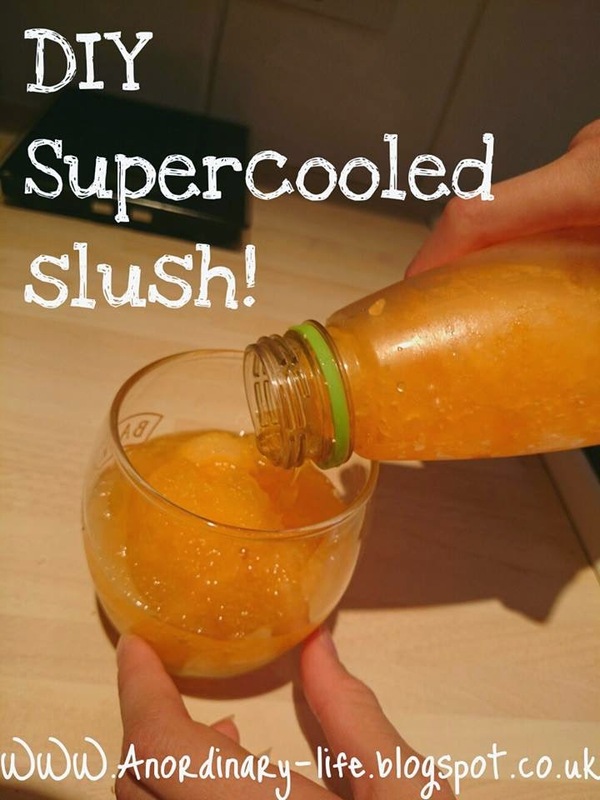 SUGAR - if the drink has too much sugar ice crystals may form more quickly but with no sugar the slush can be too solid to remove from the drinks bottle. SIZE - The bigger the bottle the more thermally stable it is so smaller bottles work best! CARBONATION - The gas pressure helps towards the supercooling effect, it speeds up slush formation so the fizzier the better. THE CONTAINER - plastic containers work better than metal or glass containers that cool faster. Plastic bottles will keep a liquid in a supercooled liquid state for longer. A supercooled cloud is containing pure water droplets at temperatures a lot lower than the nominal freezing temperature of 0°C. With very pure water (i.e. free from pollutants), supercooling of liquid drops can occur down to around minus 40°C. Clouds at high altertudes, like Altocumulus clouds are good usually composed of water droplets at temperatures well below zero.